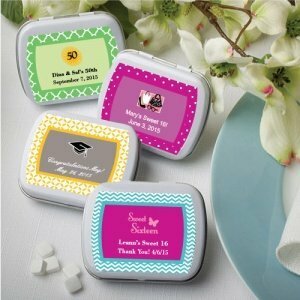 Fun and creative, our personalized any occasion favor mint tins will add some smiles to your next celebration! Fill them with the candies or mints of your choosing and have fun designing the tins with our numerous customization options to make a gift that is the perfect favor for your event. As shown in the image, they make great personalized sweet 16 favors, graduation or birthday party favors. Each white metal rectangular mint tin measures 2.375" x 1.875".